Hugo was born about six hours before I officially reached the 38-week mark in my pregnancy, which was of course a lot earlier than we were expecting him. Truthfully, I kind of always suspected he might come a little bit before my due date—how else to explain the packed hospital bag, the well-stocked diaper drawer, and the carefully washed and folded onesies, THANK GOODNESS—and I guess maybe I was sort of secretly hoping he might be born on July 14th, which would have been my Omi's 87th birthday, but when I woke up at 2am a couple of Fridays ago to find that my water had broken, the first thought in my head was "Really? Now?" I have so much more I want to write about—Hugo's birth, Hugo's first couple of weeks at home, the ridiculous extent to which Sean and I are both joyfully, ecstatically, overwhelmingly in love with Hugo—but I'm trying to stick to that old "sleep when the baby sleeps" adage, which I have to begrudgingly admit is helpful, even if it does rather cut into my staring-in-wonderment-at-the-baby time. I will just say this though, and I hope it's not too sickly sweet: I am so blissfully happy with my new little family that I can hardly even believe I got so lucky. Even when I'm up at 3am for the fourteenth night in a row. Beautiful pictures, beautiful family. Congratulations to you and Sean! Goodness. Weepy at six A.M. over these lovely pictures, and when I saw the one with the blocks over his head I howled laughing, because I pictured Hugo on his 25th birthday being forced to lie down while you put blocks over his head saying "1300 weeks"! Just beautiful, all of it. And I know I've said it before, but dayum Sean is handsome! Tell him he should never cut his hair. So beautiful! Nb, this is written from one still on the other side, crazily googling things like 'pre labour or too much ice cream?' and hoping that when he deigns to arrive my little man is half as gorgeous as yours. Thanks for sharing Holly, and congrats again! Also, your mum and dad don't look old enough to be grandparents! what a beautiful little boy. once again many congratulations to you and Sean and your family. I remember when my nephew was born, I couldn't stop staring at him, so I can only imagine how you guys must be feeling. All the best to you guys beautiful Hugo. This post makes me smile. Love all the pictures, and like the commenter above me, especially the second one. Aw! He's so cute!!!! i remember that Blissfully happy feeling and 2 1/2 years later i still have it! Children change you in the best possible way! its funny how they come in the world and without even knowing it, bring so much love with them! So happy for your family! Oh Holly I'm just so, so happy for you guys. It goes by so so quickly. Miriam will be 5 weeks on Monday and it's absolutely crazy to fathom how quickly and completely your life changes (even though you have 9 months to "prepare"). Selfishly I'm glad Hugo came early so that our little ones are even closer in age and going through some of the same stages together. I love all the photos! Congrats again! Lovely family! Beautiful baby - congratulations. Isn't it amazing how much love you can feel for such a little thing? Thanks for sharing these photos! Congratulations Holly and Sean. Hugo IS SO ADORABLE! There is nothing and I mean NOTHING more HANDSOME than a Dad and his Baby. I JUST LOVE LOVE LOVE the pics with Hugo and Sean. Your parents do not look old enough to be Grandparents. Enjoy these moments as MUCH as you can things will get CRAZY FAST. I look at me son now 21, married and on his own, think back to the day he was born. Thank you for sharing these beautiful moments with all of us. OMW those photos are just too gorgeous! and you look fab too. you are oozing happiness in your pictures and its lovely to see. And how tiny is Hugo. just precious!! I'm so happy for you guys! I remember that "this is MY family feeling". Overwhelming but wonderful! OH Holly! I am beyond overjoyed for you! I've got 7 weeks to go for our baby boy and have reached that uncomfortable stage. Reading your blissful happiness and seeing your gorgeous little man has rejuvenated my very soul. Blessings to you, Sean and little Hugo. Seriously one of the cutest babies I have ever seen! I can only hope my little nugget comes out that adorable. Congratulations, and welcome, Hugo! Beautiful boy! And your parents look SO proud and happy! Congratulations again! It only gets better if you can believe it. He is so adorable and you and your husband look so happy! He is so tiny, too! I've been selfishly awaiting this post! Beautiful. Despite I always said that I don't want to have kinds, lately I'm starting to change my mind (I'm 31), and this post and feeling your happiness just encourages me to think about it! I'm really happy for you and your family, you have such a beautiful baby boy! Great pictures! i'm so happy for you and Hugo is just absolutely adorable. I look forward to more posts!! ENJOY! first time and I totally agree. Congrats! So happy for you and your little family!! He is SO cute! Awww... he is adorable! Thanks for sharing such great photos of your family - you look so happy and blessed in them. Also, is it funny that Hugo looks like a normal-size newborn in everybody's arms except those of your husband? In Sean's arms, the baby looks positively tiny! Congratulations! He is so beautiful! And so *new*! I love that everything about him is brand new. He almost makes me want to have another baby. Congratulations again! Congrats! He is simply adorable! Treasure every moment, time flies. Hugo is so precious! Congratulations! I laughed when you said you googled to see if your water really broke because when I went into labor, we consulted the books we got in our birth class and googled "contractions" to try and figure out if we were timing them correctly, etc. Holy hot stuff, fatherhood looks good on Sean. Congrats to you all, and continued sickly sweet in lovey-ness ! 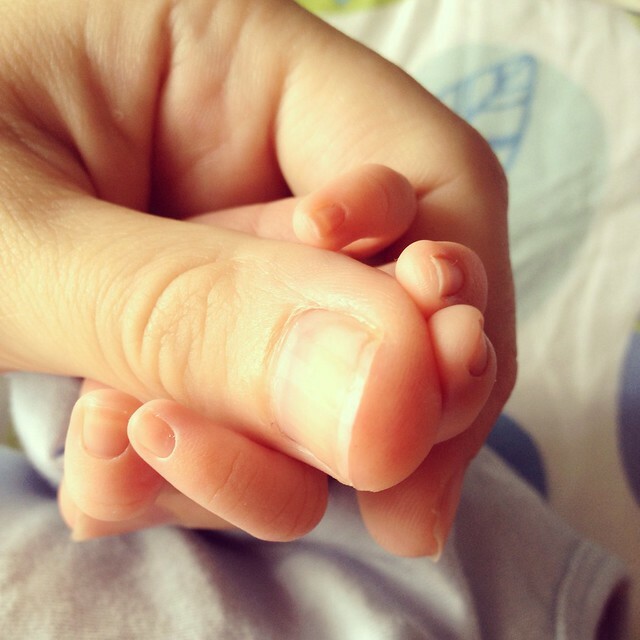 Congratulations to your little family, he is absolutely lovely! Welcome to motherhood, Holly ... that blissful happiness? It never leaves you (well, 13 months and counting for me ...). Welcome to the world, Hugo! Sean, Holly & Hugo, Best wishes to all of you as you embark on the most gratifying, fun-filled, puzzling, challenging, happiest, loveliest time you will ever know! I am happy to be privy to your lovely pictures and stories. He is a beautiful, perfect little boy! AND YOU ARE LOOKING AMAZING POST BIRTH!!!!!! P.S. If I may ask a small favor? I would love a copy of the famous egg salad sandwiches. Absolutely beautiful family. I've tried so hard to not "like" all your photos on instagram, but it's so hard because he's so adorable and you're so lucky. Lucky Hugo. It's official -- your mother is by far the youngest-looking grandma on the planet, Sean the hottest new father ever, you the most gorgeous, glowing and together-seeming new mama one could possibly imagine, and your father? The epitome of proud! Hugo, of course, is beyond adorable. I have been smiling giddily for days to think of how happy you must all be with each other. Precious moments, every single one of them. Also, that "doing nothing all day except stare at the baby" thing? I remember it well. I think it was at some point during the second week when Jim came home at the end of the day to find me in the same rocking chair, wearing the same robe and the same bemused expression on my face I'd had on when he left in the morning. Oddly, the pile of laundry seemed to have doubled in his absence even though I had apparently not moved a muscle. Enjoy every moment of your new love affair. The pictures are just wonderful! And your mom and dad look like the second happiest couple on the planet! Oh, and did Hugo's bum live up to expectations? He's just gorgeous. So precious. Congratulations on a gorgeous little guy! Hugo looks absolutely adorable but your husband looks exhausted! You , on the other hand, look positively radiant! How do you do it? He is just so perfect! I still remember those first few weeks - in fact, I remember coming home from the hospital, placing the carrier down in the kitchen, and bursting into tears because I didn't know how to do this. Those first few weeks are exhausting but magical, feeling those tiny hands wrap around your finger. And try to smell him as much as possible - that new baby smell is fantastic. The old adage about them growing too fast is too true - mine is now two and giving me a run for my money. Thank you for posting the pictures of your adorable Hugo and family! Also, couldn't help but wonder: is that the sweater you bought when you first found out you were pregnant?! So cute! So lovely - congrats on it all! Beth: you do not want to know about the cabbage leaves. Trust me! Niobe19: I am pretty sure the egg salad recipe is just eggs, mayo and butter, but the exact quantities are a mystery. A LOT of each, I would imagine! Pam: curiously it did not! It's tiny! Not a Burns Bottom at all. Not yet, anyway. Jas: Ah, you're so sweet, but I rather suspect it's mostly caffeine and adrenaline. And I think Sean has the kind of face that ALWAYS looks exhausted! Megan: It's not, but good memory! That one would swamp him right now, but should be wearable in about a year! Holly, he is ADORABLE. congratulations again! can't wait to more about little Hugo. Gorgeous gorgeous photos, Hugo is just adorable. I love his facial expression in the '1 week' photo (love the blocks too), it's a real "holy crap, I'm here" look, beautiful!! Oh Holly and Sean he is so beautiful. I love the pictures and am glad he arrived safely. Love the pic of your mom and dad. What beaming grandparents they are. Congratulations! Love all the photos. Hugo is such a cutie. So happy for you all. Yay for baby boys! I don't have any specific part of this to comment on, but just so pleased that everything is going so well for you and your family. Life is wonderful. A million congrats. He is precious! I've been anxiously awaiting this post!! what beautiful pictures! I've got a 7-week old and seeing how little Hugo is reminds me of just how quickly they grow. And my little girl is only 7 weeks!!! Congratulations, congratulations! Congratulations! I can't believe how amazing you look in that last picture! So, I have been loving your Hugo pictures so much I actually had a dream my friend and I (both avid readers of your blog) went to your house to meet you and the baby...because that's not weird. I am late to the game: Congratulations! The photo of your parents holding him made me a little misty eyed! So sweet. He is the cutest thing ever! My baby just turned 1 so this time last year I was also wrestling a newborn. It was overwhelming, but I really, really miss him sleeping with me, on me, attached to me, etc. I did the cabbage leaves trick a few months ago. Felt great, smelled horrid. Congratulations from another Hugo's mother- mine turned one on July 9. :) Enjoy. Hugo is beautiful! I'm sitting here holding my own little 6.5 week old bundle of boy, typing with one hand. Already I feel that bittersweet sense that my son is growing and changing. I never thought I'd feel that way so early on, but I do. So soak up each and every moment and enjoy your new little family! I can't even stand it, the sheer adorableness of it all. So happy for you guys! What a beautiful blessing! Congratulations. Amazing how small they are when you compare them to you. The second photo made me awwww. Glad I've finally found sointhmeg I agree with!